RALEIGH — California-based Apple promotes its 500,000-square-foot data center in Maiden, N.C., by saying it runs “100 percent” on renewable energy even though the facility continues to get all of its electricity from Duke Energy, a public utility that primarily generates electricity using coal, nuclear power, and natural gas. Apple bases its claim on the concept that it “offsets” power purchased from Duke by generating power from renewable sources, even though Apple does not make it clear that the energy powering the Maiden facility comes from Duke Energy’s traditional mix of fuels. There are no public records supporting the details of Apple’s offset concept as a way of measuring its participation in renewable energy. Apple is not alone in making such claims. Amazon Web Services has stated that the energy produced by a 22,000-acre wind farm near Elizabeth City will power a data center near Dulles International Airport in Virginia. In fact, the data center is purchasing and will continue to purchase electricity from Dominion Power, the local utility. The wind farm is not and cannot be connected directly to Amazon’s Virginia data center. Apple representatives have refused to answer a series of queries from Carolina Journal seeking details about the company’s electricity consumption at the data center or details about the sources it uses to offset energy purchased from Duke. 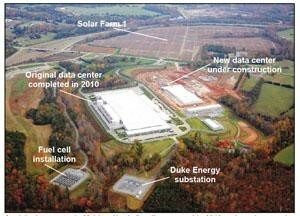 Apple owns a 20-megawatt solar farm and a 10-megawatt fuel cell system adjacent to the data center, but the electricity generated by the solar farm and fuel cell system is sold to Duke and does not provide power for the building. The fuel cell system runs on natural gas purchased from Piedmont Natural Gas even though Apple has used promotional materials to suggest it actually runs on biogas from nearby landfills. Apple has a second solar farm located about 11 miles away in Conover. A third solar farm is located six miles away, and a fourth solar farm is located nine miles away. They should be completed by the end of the year. A second data center building is under construction. Apple spokeswoman Alisha Johnson did not answer questions by phone or email from CJ regarding this report. Instead, Johnson referred CJ to Apple’s Environmental Responsibility Report, which includes the renewable energy claims about the solar farm and fuel cell array at Maiden. In August, Truthout, a left-leaning California-based organization, published a scathing criticism of Apple’s claims titled “Why Is Apple Lying About Powering Its Data Centers With Renewable Energy?” The author, Nicki Lisa Cole, is a research fellow at the Institute for Advanced Studies on Science and Technology and Society in Graz, Austria. A longtime Apple critic, Cole is writing a book about the popularity and hidden costs of Apple products. Cole noted that Apple’s interest in investing in renewable energy surfaced after the Maiden facility opened in 2010 and appears to be the result of a critical report by Greenpeace dealing with energy consumption at large data centers. After Greenpeace commended Apple for pledging in a May 2015 report to power its data centers with renewable energy, “countless headlines praising Apple followed,” Cole wrote. “But dig below the slick PR surface of Apple’s claims and celebratory headlines, and one finds that the jewel of Apple’s data centers, its facility in Maiden, N.C., is not powered by renewable energy at all, though the company states in its 2014 Environmental Responsibility Report that it has been ‘100 percent renewable since opening in June 2010,’” wrote Cole. “Purchasing offsets is not the same as actually powering something with renewable energy,” she wrote. She noted that Apple buys all of the energy it needs from Duke Energy. “What all of this amounts to is a boldfaced lie on Apple’s part,” she wrote. Apple spokeswoman Johnson did not respond to a request from CJ to comment on Cole’s story. The nonprofit Institute for Energy Research in Washington, D.C., in March released a critique of corporate renewable energy claims that included Apple. IER’s Travis Fisher published the analysis titled “Busting the ‘100 Percent Renewable’ Myth.” Fisher, a former intern with the John Locke Foundation, spent seven years as an economist with the Federal Energy Regulatory Commission before joining IER. Duke Energy economic development officials played a key role in recruiting the data center for North Carolina. Starting in 2006 they spent three years working on the project that was announced to the public in 2009. “Power costs and reliability are a data center’s primary concerns. We were able to convince Apple that we were capable of providing the low cost and reliability they needed for their operation,” Duke vice president Clark Gillespy stated in a project summary published by Duke. “The great thing about a data center is that they run full-out, 24/7, with no shifts and no seasonality. It’s the type of customer where the meter spins and spins at an exponential pace. It may be the most ideal customer we could have. We fully expect Apple to be one of our top 10 customers in the Carolinas,” Duke’s director of business development, Stu Heishman, wrote in the same project summary. House Majority Leader Mike Hager, R-Rutherford, was a Duke Energy engineering manager from 1995-2003. He had the responsibility for the operation and maintenance of five coal-burning units. Hager and other legislators have tried to eliminate or freeze North Carolina’s renewable energy standards, which they say are costly to consumers. He told CJ he was not shocked by Apple’s misrepresentations regarding its 100 percent renewable claim. “If you tell a lie often enough you start believing it,” Hager said. “Misunderstandings and misinformation from renewable advocates have made the discussion over renewables confusing. I think it is purposeful, because they want folks to think that this [solar] is a lower-cost energy, that it is dispatchable” — meaning it can be turned on or off in a short period of time — “and that it is easily obtained. But it is not dispatchable. You don’t get it when you need it, and it is costly,” Hager added. Since 2012, all our data centers have been powered by 100 percent renewable energy sources. That means no matter how much data they handle, there is a zero greenhouse gas impact on the environment from their energy use. These data centers use renewable energy sources like solar, wind, biogas fuel cells, micro-hydro power, and geothermal power from onsite and locally obtained resources. On any given day, our data centers will use renewable energy to serve tens of billions of messages, more than a billion photos, and tens of millions of FaceTime video calls. They also run services like Siri, the iTunes Store, the App Store, and Maps. So every time a song is downloaded from iTunes, an app is installed from the Mac App Store, or a book is downloaded from iBooks, the energy Apple uses is provided by nature. Our Maiden, N.C., data center has earned the LEED Platinum certification from the U.S. Green Building Council — the first data center of its size to be so honored. On any given day, between 60 and 100 percent of the energy it uses is generated onsite through our biogas fuel cells and two 20‑megawatt solar arrays — the nation’s largest privately owned renewable energy installation. And we’ll finish another 17‑megawatt solar array later this year. We purchase any remaining power we need from entirely clean sources located within North Carolina. Fully dissecting Apple’s claims requires more information than Apple will share. CJ asked Apple for the peak megawatt load at the existing building in Maiden and what it would be after the new building is put in service. Apple did not respond. CJ also asked for the annual megawatt-hours used by the existing building and the anticipated megawatt-hours required with the addition of the new building, but again Apple did not respond. • Apple claims that two solar installations were responsible for 39 percent of its power. Apple fails to mention that they operate only at about 24 percent of capacity because they produce power only when the sun is out. Apple will not share the actual megawatt-hours produced by each solar installation and the time periods they were producing. The electricity produced by the solar installations is sold to Duke Energy. • Apple claims fuel cells provided 37 percent of its power. The fuel cell installation is relatively new technology that produces electricity through a chemical reaction. Apple’s system is manufactured and operated by Bloom Energy. It runs on natural gas supplied by Piedmont Natural Gas even though Apple has led people to believe that it runs on biogas extracted from nearby landfills. The electricity produced by the fuel cells is sold to Duke Energy. Initially, Apple contracted with Element Markets, a Texas company that processes landfill gas to obtain a quality that can be added to natural gas lines where it is metered and sold to Apple or other entities. Apple does not share exactly how much natural gas the fuel cell installation consumes or how much biogas is purchased to offset the natural gas usage. Piedmont Natural Gas gives Apple credit for its biogas purchases on its gas bill. Apple and other NCGP customers purchase “blocks” of energy from small solar or hydro producers. CJ was unable to determine how much Apple has spent on the program, and NCGP will not answer questions about an individual customer. Not included in Apple’s environmental reports is the company’s reliance on diesel generators. According to a state air quality permit, as a backup power source the data center has 24 2.25 MW diesel generators for a total capacity of 54 MW. Two former senior officials with the U.S. Environmental Protection Agency guide Apple’s messaging about renewable energy. Spokeswoman Johnson joined Apple in September after working as a senior adviser on climate change for U.S. Secretary of State John Kerry. Before that, she spent four years with the EPA, first as the press secretary and then as deputy associate administrator for external affairs and environmental education. Lisa Jackson was EPA administrator from 2009 to May 2013, when she joined Apple as vice president for environmental initiatives. She reports directly to Apple president Tim Cook.